Home › Google | Reviews | Social Media | Uncategorized › Is Bring Your Own Device (BYOD) Good or Bad for Education? 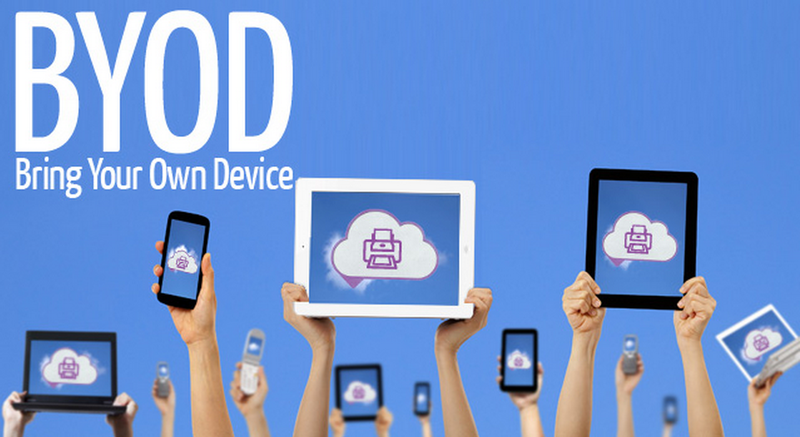 Is Bring Your Own Device (BYOD) Good or Bad for Education? For as long as handheld portable electronic devices have been around–walkman, mp3 players, iPods, iPads, tablets, cell phones–school administrators have banned personal technology from the classroom setting. But school systems are starting to relax these standards to accommodate for 21st century learning patterns. Many public and private schools have put a voluntary Bring Your Own Device (BYOD) policy in place to facilitate learning in the increasingly digital age. Should students be allowed to use their devices in the classroom? What do you think? We’ve come up with a short list of pros and cons for BYOD. Do you have any experience with a BYOD school? Let us know your opinions in the comment section below! Yes, students should be able to BYOD! Many believe that introducing personal electronic devices, like laptops and eReaders, will facilitate learning in the classroom. And while some are worried about Internet access, most school systems have relatively strict web filters in place to block any inappropriate or spammy content. Suburban Maryland school district, Caroll County Public Schools, has instituted a voluntary BYOD policy. According to the school board, there are many benefits of bringing personal technology to the classroom. I can’t image taking notes during class without my laptop. It’s so much easier to keep up with a lecture when you can type 90 WPM. In this way, laptops and tablets could encourage students to pay attention during class because its easier to do so. And the sooner you introduce students to learning with personal devices, the easier learning at an accelerated, college-level would become, where bringing your laptop to class is the norm. No, students should not be able to BYOD. While BYOD hasn’t quite caught on just yet, many teachers and parents are worried that bringing electronic devices into the classroom setting will create even more distractions for students. After all, kids are pretty smart, so how can you rely on internet filters to keep sneaky students from accessing sites that they shouldn’t be? The Internet is a completely different ball game today as it was when I was in school ten years ago, and we easily found ways to bypass our schools filters using other tactics back then. (My personal favorite was using Google Trinidad and Tobago to get us to our favorite gaming sites.) I’m sure kids are just as inventive today. This brings us to another point. How could you stop students from using various social or entertainment applications during class time? There really isn’t a way to monitor personal devices other than manually, so a BYOD policy seems like it would become a headache for teachers more than anything, creating a distraction for both teacher and student. Another issue we can’t quite come to terms with is the fact that these laptops, tablets and eReaders are expensive. What about the students who can’t afford them? Would there be a system put in place for students who didn’t have access to devices? Unless a school had a system for checking out laptops or tablets, we can’t see how a BYOD would be fair for less privileged students. students are capable of using technology!!!!!!!!!!!!!!!!!! !